The Changing Face of Dominican Cigars, Part Two. With long morning shadows streaking down the narrow Santiago streets, we could see groups of children in all directions. Dressed in colorful blue outfits, they playfully made their way along the busy streets towards school. Once again, the charming spirit of DR was everywhere. This was going to be a nice day. One of our lovely guides. Suddenly turning right off the main road, we proceeded through a large iron gate into La Flor Dominicana. Once inside, two lovely young ladies greeted us. These were to be our guides for the factory tour. After an apology for all the construction, (the factory was under a major expansion), we were each given a LFD Ligero toro cigar to smoke. Perhaps it was the early hour, but within a few minutes I could feel the intoxicating effects of this strong cigar. At that point I recalled it was Litto Gomez, the owner of LFD, who started the whole ligero cigar craze. To my memory, it was he who first put the word “ligero” on a cigar band. And those cigars WERE strong, and hugely popular. After the success of the Ligero line, Litto introduced the Double Ligero. Before long, strong cigars were an industry-wide craze. But innovation was nothing new to Sr. Gomez. In fact, he holds the only cigar patent in the world. His Chisel cigars have a copyright, and no other cigar manufacturer can have its signature, tapered “chisel” cap. A mold for the patented LFD Chisel. The LFD factory is a beautiful facility. Natural woods are used throughout the décor, and the work areas are well lit and colorful. One could tell that the workers enjoyed being there, and were proud of the product they were making. We were led through a storage room where tobaccos from all over the world were being aged. Nicaragua, Honduras, Ecuador…all the great tobacco regions were represented. Next came the sorting, bunching, rolling, and packaging. At each stage, Litto Gomez’s influence was felt. 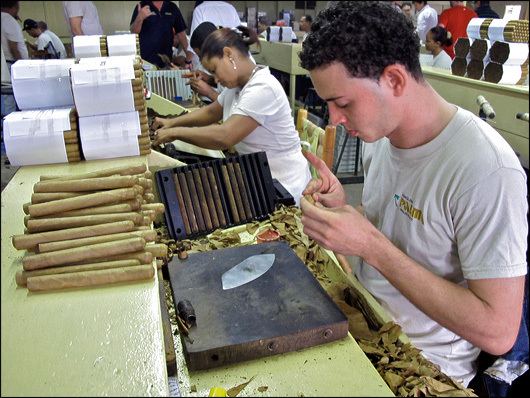 There is elegance to his cigars, and his factory reflects this sensibility. 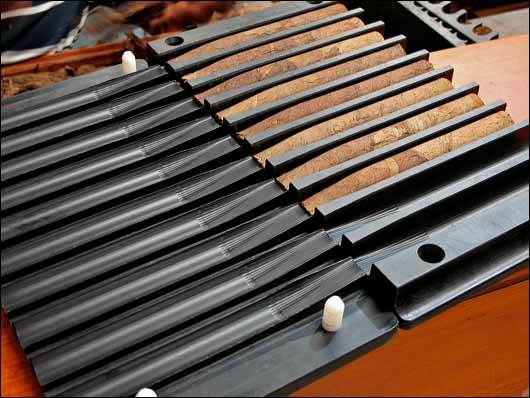 Right down to the beautiful stained-wood bins containing the raw tobacco. Everywhere you looked, functionality joined aesthetics. Tabacalera Palma, home of Aging Room Cigars. Relatively new to the game, Aging Room Cigars has garnered ratings that many cigar makers could envy. I became an early convert when the M356 first came out a couple of years ago. I was astonished by its effervescent quality, and bright flavor profile. I had never smoked a cigar quite like it. This hit me at a time when I was getting bored with the dark, earthy flavors coming out of Esteli, Nicaragua. I needed a change, and the Aging Room M356 gave me something new and unexpected. Rafael and Joshe demonstrate cigar rolling styles. As you might imagine, the prospect of visiting Tabacalera Palma was an exciting one. When I found out that Rafael Nodal and Hank Bischoff would give us the tour, I was anticipating something truly special…and it turned out to be that and more. Rafael and Hank co-founded Boutique Blends, the company behind Aging Room Cigars. Originally, these two met while in the mental health field in Miami. But their mutual love for cigars brought them together and, ultimately, to owning their own cigar brand. Of Cuban decent, Rafael came to the US during the Mariel boatlift. At that time, the summer of 1980, thousands of Cuban refugees fled the island in search of personal freedom. The oppressive Castro regime was taking its toll on the Cuban population and people wanted out. Desperate to escape, refugees in overcrowded boats attempted the treacherous voyage to the US. Rafael and his family, after days at sea, finally arrived safely on the Florida shore. Those caught trying to escape were imprisoned. Rafael’s story is an interesting one, but I digress…on to the factory tour! Not your typical cigar factory. From the outside, Tabacalera Palma is non-descript. It looks like a small office building with no signage at all…a far cry from LFD. But I was going to reserve judgment. Once inside we were introduced to Rafael, Hank, and a principle owner of Tabacalera Palma, Jose “Joshie” (pronounced Hoshie) Blanco. (We were also joined by Vinnie Cuello, a young member of the Palma community.) 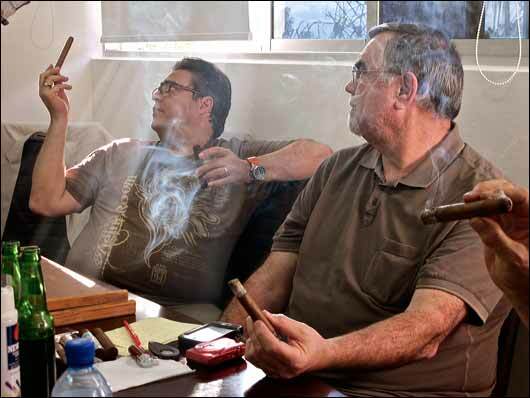 From the moment we met, their enthusiasm for cigar making was contagious. These guys loved their work. A roller at Tabacalera Palma plying his craft. Stems are removed by hand at Tabacalera Palma. 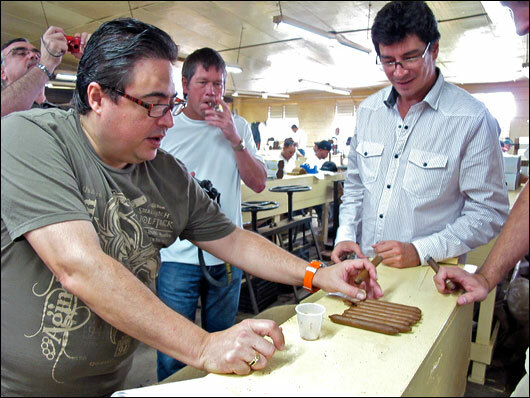 While observing the torcedores at Tabacalera Palma, Rafael invited us to try our hands at cigar rolling. We all took turns, and I can tell you from my experience, cigar-rolling ain’t easy. Getting the wrapper stretched perfectly without causing a tear requires dexterity. My stick came out okay, and smoking it months later was especially fun. But the highlight of any factory tour is smoking the factory-fresh cigars, a truly unique experience. At Tabacalera Palma, they took this to a whole new level. It’s all in the blend. At Aging Room Cigars, an interesting experiment is underway, The Wild Pack. In this project, they want us to help them find their next great blend. (For more info see Sneek Peek). 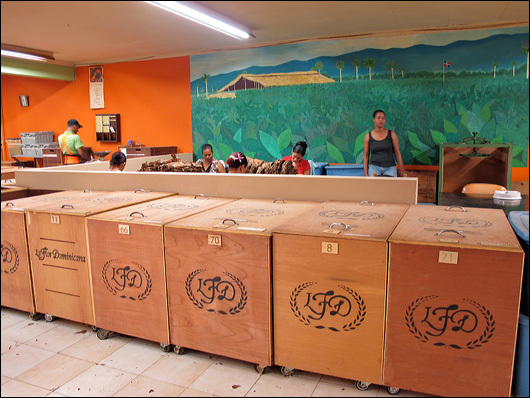 After our factory tour, we joined Rafael et al in the conference room and were presented with six trays of cigars. There, we smoked different combinations of wrappers over three different blends. We then filled out scorecards for each cigar. These cigars were under consideration for the soon to be released Wild Pack project. It was a fun experiment, and the public will be able to participate this June. During our tasting it became clear that Aging Room is not your typical cigar company. Their recent success of the M356 has demonstrated the advantages of small batch cigar making. 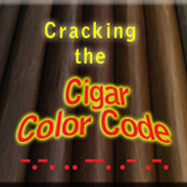 Exceptional cigar tobacco is often in limited supply. 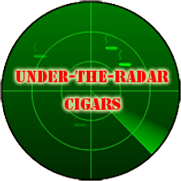 This means that once the tobacco is gone, recreating the blend becomes difficult. Rather than trying to keep a great cigar line alive from year to year, Aging Room is dedicating itself to the small batch philosophy. 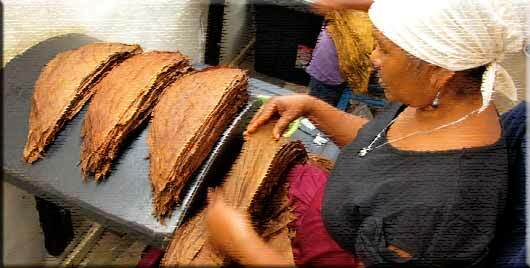 Their main focus will be to make outstanding cigars with the best tobacco they can find, period. Once the tobacco is used up, that blend is over. And these guys are VERY critical. 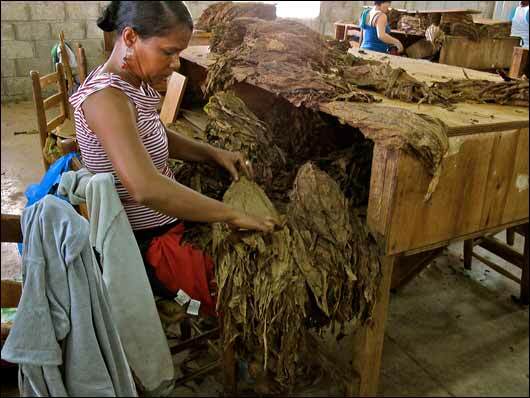 While smoking with them at the Tabacalera Palma, it became clear that making a good cigar was simply not good enough. We tasted cigars that other manufacturers might have released…but not Rafael Nodal. He rejected even the good blends as not ready for production. He was looking for excellence, and nothing less would do. To me, this is the mark of a great boutique cigar company. With this work ethic and hypercritical R and D, we can expect many more great cigars from Aging Room. Wonderful and informative post! Thank you for the detailed descriptions of the experiences you had. Definitely need to explore the LFD world/Tabacalera Palma releases in the future.